Being 40 pounds overweight used to feel almost normal to me because I didn't remember what it felt like not to be. I got used to being inactive, used to eating for emotional reasons, and used to going on crash diets to keep my ever increasing mass at bay. But the emotional discomfort outweighed (pun intended) the physical, at least for me. I was always self conscious and forever trying to find ways to hide my bulk. 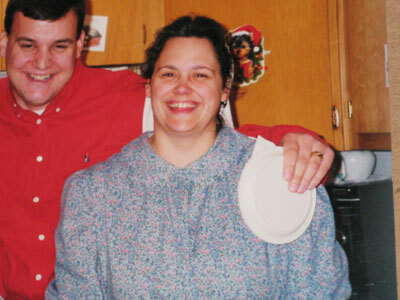 Like countless numbers of other compulsive dieters I had my fat clothes and skinny clothes. 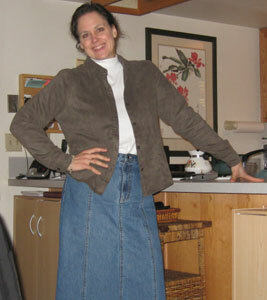 When things would get desperate I would 'Atkins off' about 15 pounds and proudly wear my skinny clothes. Only problem was, I looked like I had melted! Yeah, the fat had melted off, and that's just what I looked like afterward. When I made a slow and intelligent transition to the raw food diet, I managed to release 35 pounds. I wasn't even really paying attention to the weight loss so much because I was just trying to stick to the program outlined in the 100 Days to 100% Raw ebook. I knew it was coming off, but by the time I got to my original goal, it just felt natural and normal. The added bonus was I didn't look melted; I just looked like a healthy person who needed to tone her muscles a little bit. 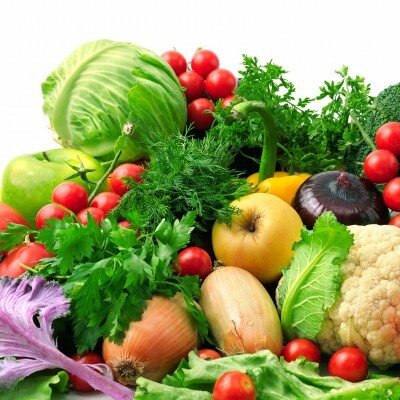 Because with raw foods , unlike crash dieting, you are giving you body the most optimal nutrition, you are able to lose weight in the right places and proportions and at the right pace. The first picture was taken at 34 before I ever heard about raw foods. The second picture is the 'After' photo at the end of the 100 Days to 100% Raw program. Age 42. The third picture was shot at age 44 after I have been practicing hot yoga for 4 months. When I got a hold of Tonya Zavasta's new book Raw Foods and Hot Yoga: From Severe Disability to Superior Health I had no idea that it would open up a new chapter in my life (another pun intended). Just when I thought I had read it all, along comes what I now refer to as my personal Health Handbook. 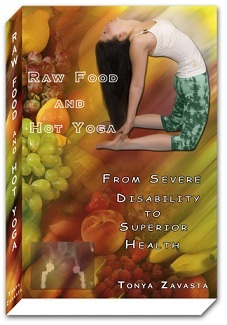 This entertaining and informative book does not necessarily focus on yoga poses, but about how and why to combine the raw foods diet with Bikram yoga for maximum benefits. Yet, there is something in it for every health seeker whether beginner, intermediate, or advanced. Tonya tells her own story with intelligence, depth and humor while exhorting the reader that if she can accomplish superior health with all of the obstacles that she has had to overcome, then so can you! She will leave you without excuse because included in this book are chapters about changing your diet, your mindset, detoxification, anti-aging, supplements, social life, sleep habits, glowing skin and much more along with a candid and unbiased Question and Answer section about various aspects of eating the raw food diet. No stone is left unturned, and you will understand how it all fits together and why you do what you do when you effectively 'marry' the raw food diet and hot yoga. 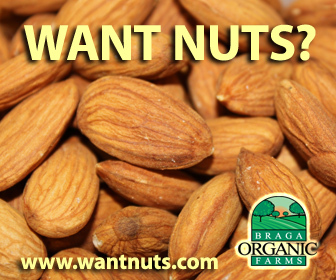 There is also an enticing recipe section to assist you with that very thing. You can see why I refer to it as my personal Health Handbook. My curiosity was so piqued by the information about Bikram yoga and its many benefits I simply had to try it for myself. To begin with, I was not athletically inclined by any stretch of the imagination. Moreover, I was philosophically suspicious of anything to do with yoga, and the thought of breaking a sweat appealed to me about as much as paying income taxes. I scouted out a local studio and dragged my daughter along with me to see what all the fuss was about. That was four months ago. I was hooked from the very first class! Along with a renewed sense of well being that I didn't even know was missing, I also gained improved flexibility and endurance, and even increased emotional poise. I can truthfully say that the stress-induced vertigo that I was suffering with is now a thing of the past thanks to the raw food diet and Tonya's new book Raw Foods and Hot Yoga.